Not to be confused with the Romanian, Roman, Romang or Romansh languages. Romani (/ˈrɒməni, ˈroʊ-/; also Romany; Romani: romani čhib) is any of several languages of the Romani people belonging to the Indo-Aryan branch of the Indo-European language family. According to Ethnologue, seven varieties of Romani are divergent enough to be considered languages of their own. The largest of these are Vlax Romani (about 500,000 speakers), Balkan Romani (600,000), and Sinte Romani (300,000). Some Romani communities speak mixed languages based on the surrounding language with retained Romani-derived vocabulary – these are known by linguists as Para-Romani varieties, rather than dialects of the Romani language itself. Speakers of the Romani language usually refer to the language as řomani čhib "the Romani language" or řomanes "in a Rom way". This derives from the Romani word řom, meaning either "a member of the (Romani) group" or "husband". This is also where the term "Roma" derives in English, although some Roma groups refer to themselves using other demonyms (e.g. 'Kaale', 'Sinti', etc.). The English spelling "Rromani language" (with two initial Rs) may also be found, reflecting a different transcription of the Romani phoneme ř. Before the late nineteenth century, English-language texts usually referred to the language as the "Gypsy language". While it is derogatory, in the USA, "gypsy" is still the most-understood term, as "Romani" is not in common use there. In the 18th century, it was shown by comparative studies that Romani belongs to the Indo-European language family. In 1763 Vályi István, a Calvinist pastor from Satu Mare in Transylvania, was the first to notice the similarity between Romani and Indo-Aryan by comparing the Romani dialect of Győr with the language (perhaps Sinhalese) spoken by three Sri Lankan students he met in the Netherlands. This was followed by the linguist Johann Christian Christoph Rüdiger (1751–1822) whose book Von der Sprache und Herkunft der Zigeuner aus Indien (1782) proved Romani was descended from Sanskrit. This prompted the philosopher Christian Jakob Kraus to collect linguistic evidence by systematically interviewing the Roma in Königsberg prison. Kraus's findings were never published, but they may have influenced or laid the groundwork for later linguists, especially August Pott and his pioneering Darstellung die Zigeuner in Europa und Asien (1844–45). Research into the way the Romani dialects branched out was started in 1872 by the Slavicist Franz Miklosich in a series of essays. However, it was the philologist Ralph Turner's 1927 article “The Position of Romani in Indo-Aryan” that served as the basis for the integrating Romani into the history of Indian languages. Romani shares a number of features with the Central Zone languages. The most significant isoglosses are the shift of Old Indo-Aryan r̥ to u or i (Sanskrit śr̥ṇ-, Romani šun- 'to hear') and kṣ- to kh (Sanskrit akṣi, Romani j-akh 'eye'). However, unlike other Central Zone languages, Romani preserves many dental clusters (Romani trin 'three', phral 'brother', compare Hindi tīn, bhāi). This implies that Romani split from the Central Zone languages before the Middle Indo-Aryan period. However, Romani shows some features of New Indo-Aryan, such as erosion of the original nominal case system towards a nominative/oblique dichotomy, with new grammaticalized case suffixes added on. This means that the Romani exodus from India could not have happened until late in the first millennium. Many words are similar to the Marwari and Lambadi languages spoken in large parts of India. However, Romani is nearer to the Marwari spoken in Rajasthan, India. Romani also shows some similarity to the Northwestern Zone languages. In particular, the grammaticalization of enclitic pronouns as person markers on verbs (kerdo 'done' + me 'me' → kerdjom 'I did') is also found in languages such as Kashmiri and Shina. This evidences a northwest migration during the split from the Central Zone languages consistent with a later migration to Europe. Today, Romani is spoken by small groups in 42 European countries. A project at Manchester University in England is transcribing Romani dialects, many of which are on the brink of extinction, for the first time. Today's dialects of Romani are differentiated by the vocabulary accumulated since their departure from Anatolia, as well as through divergent phonemic evolution and grammatical features. Many Roma no longer speak the language or speak various new contact languages from the local language with the addition of Romani vocabulary. Dialect differentiation began with the dispersal of the Romani from the Balkans around the 14th century and on, and with their settlement in areas across Europe in the 16th and 17th centuries. The two most significant areas of divergence are the southeast (with epicenter of the northern Balkans) and west-central Europe (with epicenter Germany). The central dialects replace s in grammatical paradigms with h. The west-northern dialects append j-, simplify ndř to r, retain n in the nominalizer -ipen / -iben, and lose adjectival past-tense in intransitives (gelo, geli → geljas 'he/she went'). Other isoglosses (esp. demonstratives, 2/3pl perfective concord markers, loan verb markers) motivate the division into Balkan, Vlax, Central, Northeast, and Northwest dialects. A long-standing common categorisation was a division between the Vlax (from Vlach) and non-Vlax dialects. Vlax are those Roma people who lived many centuries in the territory of Romania in slavery. The main distinction between the two groups is the degree to which their vocabulary is borrowed from Romanian. Bernard Gilliath-Smith first made this distinction, and coined the term Vlax in 1915 in the book The Report on the Gypsy tribes of North East Bulgaria. The Vlax dialect group, now seen as just one of about ten groups (see below), has nevertheless become very widespread geographically. Matras (2002, 2005) has argued for a theory of geographical classification of Romani dialects, which is based on the diffusion in space of innovations. According to this theory, Early Romani (as spoken in the Byzantine Empire) was brought to western and other parts of Europe through population migrations of Rom in the 14th–15th centuries. These groups settled in the various European regions during the 16th and 17th centuries, acquiring fluency in a variety of contact languages. Changes emerged then, which spread in wave-like patterns, creating the dialect differences attested today. According to Matras, there were two major centres of innovations: some changes emerged in western Europe (Germany and vicinity), spreading eastwards; other emerged in the Wallachian area, spreading to the west and south. In addition, many regional and local isoglosses formed, creating a complex wave of language boundaries. Matras points to the prothesis of j- in aro > jaro 'egg' and ov > jov 'he' as typical examples of west-to-east diffusion, and of addition of prothetic a- in bijav > abijav as a typical east-to-west spread. His conclusion is that dialect differences formed in situ, and not as a result of different waves of migration. In a series of articles (beginning from 1982), Marcel Courthiade proposed a different kind of classification. He concentrates on the dialectal diversity of Romani in three successive strata of expansion, using the criteria of phonological and grammatical changes. Finding the common linguistic features of the dialects, he presents the historical evolution from the first stratum (the dialects closest to the Anatolian Romani of the 13th century) to the second and third strata. He also names as "pogadialects" (after the Pogadi dialect of Great Britain) those with only a Romani vocabulary grafted into a non-Romani language (normally referred to as Para-Romani). Caló (in Portugal and Spain). 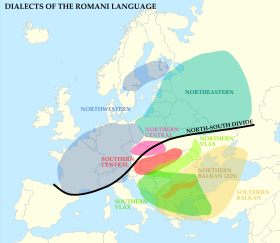 Romani is the only Indo-Aryan language spoken almost exclusively in Europe (apart from emigrant populations). The most concentrated areas of Romani speakers are found in Romania. Although there are no reliable figures for the exact number of Romani speakers, it may be the largest minority language of the European Union. The language is recognized as a minority language in many countries. At present the only places in the world where Romani is employed as an official language are the Republic of Kosovo (only regionally, not nationally) and the Šuto Orizari Municipality within the administrative borders of the Macedonian capital of Skopje. The first efforts to publish in Romani were undertaken in the interwar Soviet Union (using the Cyrillic script) and in communist Yugoslavia. Some traditional communities have expressed opposition to codifying Romani or having it used in public functions. However, the mainstream trend has been towards standardization. Different variants of the language are now in the process of being codified in those countries with high Romani populations (for example, Slovakia). There are also some attempts currently aimed at the creation of a unified standard language. A standardized form of Romani is used in Serbia, and in Serbia's autonomous province of Vojvodina, Romani is one of the officially recognized languages of minorities having its own radio stations and news broadcasts. In Romania, a country with a sizable Romani minority (3.3% of the total population), there is a unified teaching system of the Romani language for all dialects spoken in the country. This is primarily a result of the work of Gheorghe Sarău, who made Romani textbooks for teaching Romani children in the Romani language. He teaches a purified, mildly prescriptive language, choosing the original Indo-Aryan words and grammatical elements from various dialects. The pronunciation is mostly like that of the dialects from the first stratum. When there are more variants in the dialects, the variant that most closely resembles the oldest forms is chosen, like byav, instead of abyav, abyau, akana instead of akanak, shunav instead of ashunav or ashunau, etc. An effort is also made to derive new words from the vocabulary already in use, i.e., xuryavno (airplane), vortorin (slide rule), palpaledikhipnasko (retrospectively), pashnavni (adjective). There is an ever-changing set of borrowings from Romanian as well, including such terms as vremea (weather, time), primariya (town hall), frishka (cream), sfïnto (saint, holy). Hindi-based neologisms include bijli (bulb, electricity), misal (example), chitro (drawing, design), lekhipen (writing), while there are also English-based neologisms, like printisarel < "to print". Romani is now used on the internet, in some local media, and in some countries as a medium of instruction. Historically, Romani was an exclusively unwritten language; for example, Slovakian Romani's orthography was codified only in 1971. The proposals to form a unified Romani alphabet and one standard Romani language by either choosing one dialect as a standard, or by merging more dialects together, have not been successful - instead, the trend is towards a model where each dialect has its own writing system. Among native speakers, the most common pattern for individual authors to use an orthography based on the writing system of the dominant contact language: thus Romanian in Romania, Hungarian in Hungary and so on. To demonstrate the differences, the phrase [romaɲi tʃʰib], which means "Romani language" in all the dialects, can be written as románi szib, románi čib, romani tschib, románi tschiwi, romani tšiw, romeni tšiv, romanitschub, rromani čhib, romani chib, rhomani chib, romaji šjib and so on. A currently observable trend, however, appears to be the adoption of a loosely English and Czech-oriented orthography, developed spontaneously by native speakers for use online and through email. The Romani sound system is not highly unusual among European languages. Its most marked features are a three-way contrast between unvoiced, voiced, and aspirated stops: p t k č, b d g dž, and ph th kh čh, and the presence in some dialects of a second rhotic ř, realized as uvular [ʀ], a long trill [r:], or retroflex [ɽ] or [ɻ]. Eastern and Southeastern European Romani dialects commonly have palatalized consonants, either distinctive or allophonic. Some dialects add the central vowel ə or ɨ. Vowel length is often distinctive in Western European Romani dialects. Loans from contact languages often allow other non-native phonemes. Conservative dialects of Romani have final stress, with the exception of some unstressed affixes (e.g. the vocative ending, the case endings added on to the accusative noun, and the remoteness tense marker). Central and western European dialects often have shifted stress earlier in the word. mangin / mandǐn treasure Turkish mangır « penny », through a Tatar dialect. Nominals in Romani are nouns, adjectives, pronouns and numerals. Some sources describe articles as nominals. The indefinite article is often borrowed from the local contact language. General Romani is an unusual language, in having two classes of nominals, based on the historic origin of the word, that have a completely different morphology. The two classes can be called inherited and borrowed, but this article uses names from Matras (2006), ikeoclitic and xenoclitic. The class to which a word belongs is obvious from its ending. The first class is the old, Indian vocabulary (and to some extent Persian, Armenian and Greek loanwords). The ikeoclitic class can also be divided into two sub-classes, based on the ending. The ending of words in this sub-class is -o with masculines, -i with feminines, with the latter ending triggering palatalisation of preceding d, t, n, l to ď, ť, ň, ľ. All words in this sub-class have no endings, regardless of gender. e šukar - the nice (f.) - same as m.
The ending of borrowed masculine is -os, -is, -as, -us, and the borrowed feminine ends in -a.
Romani has two grammatical genders (masculine / feminine) and two numbers (singular / plural). All nominals can be singular or plural. Nouns are marked for case, the most important being the nominative and the accusative case. The vocative, nominative and indirect case are a bit "outside" of the case system as are produced only by adding a suffix to the root. Example: the suffix for singular masculine vocative of ikeoclitic types is -eja. čhaveja! - you, boy (or son)! cikneja! - you, little one! The other five cases are a little different. They are all derived from an "indirect root", that is made a little differently for each type; the indirect root is the same as the accusative case. To this root, every case adds its own suffix, with disregard to gender or type: -te / -de (locative and prepositional), -ke / -ge (dative), -tar/-dar (ablative), -sa(r) (instrumental and comitative), and -ker- / -ger- (genitive). Example: the suffix for indirect root for masculine plural for all inherited words is -en, the dativ suffix is -ke. There are many declension classes of nouns that decline differently, and show dialectal variation. The indirect case is used when a word functions as an attribute before a word, and is not considered a case in some literature. Romani shows the typically Indo-Aryan pattern of the genitive agreeing with its head noun. čhav-es-ker-i phen - 'the boy's sister'. Adjectives and the definite article show agreement with the noun they modify. mir-i daj - 'my mother'. Romani derivations are highly synthetic and partly agglutinative. However, they are also sensitive to recent development - for example, in general, Romani in Slavic countries show an adoption of productive aktionsart morphology. The core of the verb is the lexical root, verb morphology is suffixed. The verb stem (including derivation markers) by itself has non-perfective aspect and is present or subjunctive. Similarly to nominals, verbs in Romani belong to several classes, but unlike nominals, these are not based on historical origin. However, the loaned verbs can be recognized, again, by specific endings, which some argue are Greek in origin. Some words are irregular, like te jel - to be. The next three classes are recognizable by suffix in 3rd person singular. The first class, called I., has a suffix -el in 3rd person singular. Words in the second category, called II., have a suffix -l in 3rd person singular. te ladžal - to be ashamed, shy away. All the words in the third class are semantically causative passive. Borrowed verbs from other languages are marked with affixes taken from Greek tense/aspect suffixes, including -iz-, -in-, and -is-. The Romani verb has three persons and two numbers, singular and plural. There is no verbal distinction between masculine and feminine. Romani tenses are, not exclusively, present tense, future tense, two past tenses (perfect and imperfect), present or past conditional and present imperative. Depending on the dialect, the suffix -a marks the present, future, or conditional. There are many perfective suffixes, which are determined by root phonology, valency, and semantics: e.g. ker-d- 'did'. These are slightly different for consonant- and vowel-final roots (e.g. xa-s 'you eat', kam-es 'you want'). Verbs may also take a further remoteness suffix -as / -ahi / -ys / -s. With non-perfective verbs this marks the imperfect, habitual, or conditional. With the perfective, this marks the pluperfect or counterfactual. Various tenses of the same word, all in 2nd person singular. Various tenses of the word te chal, all in 2nd person singular. All the persons and numbers of present tense of the word te pašľol. Note the added -uv-, which is typical for this group. Various tenses of the same word, all in 2nd person singular again. Valency markers are affixed to the verb root either to increase or decrease valency. There is dialectal variation as to which markers are most used; common valency-increasing markers are -av-, -ar-, and -ker, and common valency-decreasing markers are -jov- and -áv-. These may also be used to derive verbs from nouns and adjectives. Romani syntax is quite different from most Indo-Aryan languages, and shows more similarity to the Balkan languages. Šebková and Žlnayová, while describing Slovakian Romani, argues that Romani is a free word order language and that it allows for theme-rheme structure, similarly to Czech, and that in some Romani dialects in East Slovakia, there is a tendency to put a verb at the end of a sentence. However, Matras describes it further. According to Matras, in most dialects of Romani, Romani is a VO language, with SVO order in contrastive sentences and verb-subject-object order in thetic sentences. The tendency to put verb on the end in some dialects is the Slavic influence. Odi kuči šilaľi. - This cup is cold. Oda šilaľi kuči. - This is a cold cup. Clauses are usually finite. Relative clauses, introduced by the relativizer kaj, are postponed. Factual and non-factual complex clauses are distinguished. Romani has lent several words to English such as pal (ultimately from Sanskrit bhrātar "brother") and nark "informant" (from Romani nāk "nose"). Other Romani words in general slang are gadgie (originally meaning "person who's not Roma", currently used as a gender-neutral term for boyfriend/girlfriend in Bulgaria), shiv or chiv (knife). Urban British slang shows an increasing level of Romani influence, with some words becoming accepted into the lexicon of standard English (for example, chav from an assumed Anglo-Romani word, meaning "small boy", in the majority of dialects). There are efforts to teach and familiarise Vlax-Romani to new generation of Romani so that Romani spoken in different parts of the world are connected through a single dialect of Romani. Indian Institute of Romani Studies, Chandigarh published several Romani language lessons through its journal Roma during the 1970s. Occasionally loanwords from other Indo-Iranian languages such as Hindi are mistakenly labelled as Romani due to surface similarities (due to a shared root), such as cushy, which is from Hindi (itself a loan from Persian khuš) meaning "excellent, healthy, happy". ^ "Ley de lenguas nativas" (PDF) (in Spanish). Bogotá: Ministry of Culture of Colombia. 2010. Retrieved 2015-12-23. ^ "Regional- und Minderheitensprachen" (PDF) (in German). Berlin: Federal Ministry of the Interior. 2008. Archived from the original (PDF) on April 3, 2012. Retrieved 2012-08-12. ^ "National and Ethnic Minorities in Hungary" (PDF). Facts About Hungary (in Hungarian). Retrieved 2015-12-23. ^ Ministry of Local Government and Modernisation. "Nasjonale minoriteter" [National minorities]. regjeringen.no (in Norwegian). Norwegian Government Security and Service Organisation. Retrieved 2019-04-08. ^ "National minorities and minority languages". Swedish Ministry for Integration and Gender Equality. 2007. Archived from the original on February 7, 2012. Retrieved 2012-08-12. ^ "Law of Ukraine "On Principles of State Language Policy"". Document 5029-17, Article 7: Regional or minority languages Ukraine, Paragraph 2. Government of Ukraine. 2014-02-01. Retrieved 2015-12-23. ^ Hammarström, Harald; Forkel, Robert; Haspelmath, Martin, eds. (2017). "Romani". Glottolog 3.0. Jena, Germany: Max Planck Institute for the Science of Human History. ^ "Romani, Vlax". SIL International. n.d. Retrieved August 12, 2012. ^ "Romani, Balkan". SIL International. n.d. Retrieved August 12, 2012. ^ "Romani, Sinte". SIL International. n.d. Retrieved August 12, 2012. ^ "Romany–English Glossary". arnes.si. Retrieved 28 August 2015. ^ Matras, Yaron (2006). "Domari" (PDF). In Keith Brown (ed.). Encyclopedia of Languages and Linguistics (Second ed.). Oxford: Elsevier. The morphology of the two languages is similar in other respects: Both retain the old present conjugation in the verb (Domari kar-ami ‘I do’), and consonantal endings of the oblique nominal case (Domari mans-as ‘man.OBL’, mans-an ‘men.OBL’), and both show agglutination of secondary (Layer II) case endings (Domari mans-as-ka ‘for the man’). It had therefore been assumed that Romani and Domari derived form the same ancestor idiom, and split only after leaving the Indian subcontinent. ^ "What is Domari?". University of Manchester. Retrieved 2008-07-23. ^ "On romani origins and identity". Archived from the original on 2011-07-17. Retrieved 2008-07-23. ^ a b "Gypsy, Roma and Traveller Achievement". Ethnic Minority Achievement. Archived from the original on 2009-06-08. Retrieved August 12, 2012. ^ a b c d Matras, Yason (2005). Schrammel, Barbara; Halwachs, Dieter W.; Ambrosch, Gerd (eds.). "The classification of Romani dialects: A geographic-historical perspective" (PDF). General and Applied Romani Linguistics - Proceeding from the 6th International Conference on Romani Linguistics. LINCOM. Retrieved 14 September 2013. ^ Šebková, Hana; Žlnayová, Edita (1998). Nástin mluvnice slovenské romštiny (pro pedagogické účely) Archived 2016-03-04 at the Wayback Machine. Ústí nad Labem: Pedagogická fakulta Univerzity J. E. Purkyně v Ústí nad Labem: p. 4. ISBN 80-7044-205-0. "U nás k tomu došlo v roce 1971, kdy jazyková komise při tehdy existujícím Svazu Cikánů-Romů (1969–1973) přijala závaznou písemnou normu slovenského dialektu romštiny." ^ Hübschmannová 1974 – p. 31, V2,1. ^ Hübschmannová 1974 - p. 60, V7. ^ a b c d Hübschmannová 1974 - p. 20, V1. ^ Hübschmannová 1974 - p. 57, V4,1. ^ Hübschmannová 1974 - p. 54, S.
^ Hübschmannová, Milena (1974). Základy Romštiny. Praha: Academia Praha: p. 7, par. 1,1. ^ Beal, Joan C. (31 March 2012). "Urban North-Eastern English". Edinburgh University Press – via Google Books. ^ Lee, Ronald (2005). Learn Romani: Das-dúma Rromanes, Hatfield: University of Hertfordshire Press. ISBN 1-902806-44-1. Matras, Yaron (2005). "The status of Romani in Europe" (PDF). University of Manchester. Matras, Yaron (2006). "Romani" (PDF). In Keith Brown (ed.). Encyclopedia of Languages and Linguistics (Second ed.). Oxford: Elsevier. Albert Thomas Sinclair. George Fraser Black (ed.). An American-Romani Vocabulary (reprint ed.). New York Public Library, 1915. Retrieved 24 April 2014.